Follow these tips to make the move as easy as possible. Start by getting your cat into a single room. This will prevent him from rushing off every time you try to get him into the carrier. Ideally, the room should be empty so there are no places for Mr. Whiskers to hide. Drop a towel on your cat and wrap it around him, preventing scratches. Then, put him in his carrier. Contact your vet for a sedative. They’re fiercely regulated, though, and you’ll usually need to take the cat to the vet to have them administered – meaning you’ll need to get him into the carrier in the first place. Stick with the towel method. Car rides are rather traumatic for cats. Expect your cat to mew and cry for the duration of the trip. Be sure to speak to your cat in a comforting and reassuring tone during the trip. This may help to calm him, but you’ll find that it doesn’t work for long. It’s not recommended that you allow your cat out of the carrier while driving, unless it’s a longer trip and your cat needs to use the litter box. Most cats will be too worked up during the move to bother using it, though. This is a two-phase process. Start by keeping your cat in a single room for two to three days. This will allow Mr. Whiskers to become familiar with the room. He’ll develop a level of comfort and a feeling of security with it, which will help with the next step. After the third day, allow your cat to roam freely through your home. He’s unlikely to venture too far from his new “home base,” and will retreat rather quickly at the first sign of danger. 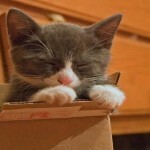 As time goes on, your cat will become more and more comfortable with his new surroundings. Eventually, he’ll be right back to his old self. While it’s debatable, many experts claim that a cat’s long-term memory only lasts about six months. Whether this is true or not, it seems that most cats have fully adjusted to major changes (such as a move) within three to six months. Help your cat ease into the transition by maintaining as many of the same routines from your old home as possible. 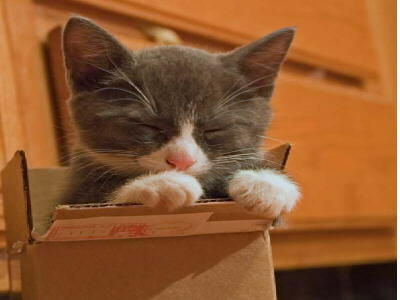 If your new home is bigger, you’ll find your cat relatively pleased with his new digs.